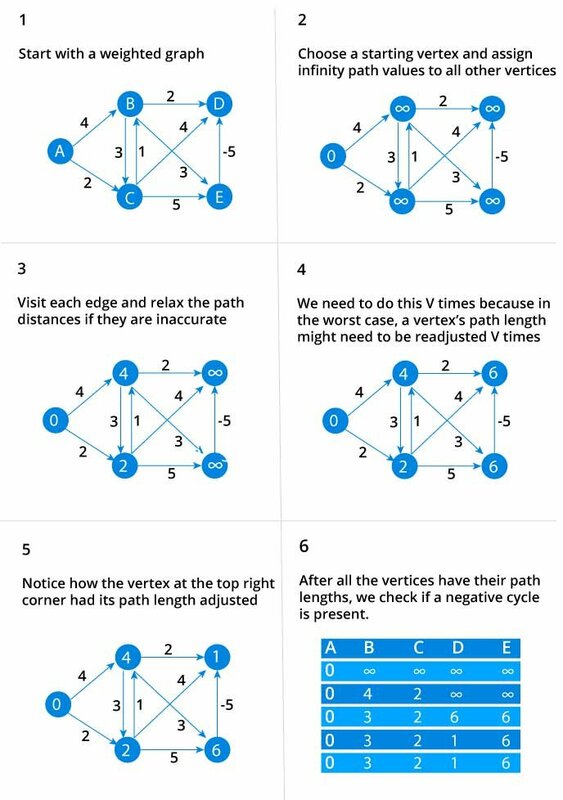 Bellman Ford algorithm helps us find the shortest path from a vertex to all other vertices of a weighted graph. It is similar to Dijkstra's algorithm but it can work with graphs in which edges can have negative weights. Why would one ever have edges with negative weights in real life? Negative weight edges might seem useless at first but they can explain a lot of phenomena like cashflow, heat released/absorbed in a chemical reaction etc. For instance, if there are different ways to reach from one chemical A to another chemical B, each method will have sub-reactions involving both heat dissipation and absorption. If we want to find the set of reactions where minimum energy is required, then we will need to be able to factor in the heat absorption as negative weights and heat dissipation as positive weights. Why we need to be careful with negative weights? Negative weight edges can create negative weight cycles i.e. a cycle which will reduce the total path distance by coming back to the same point. Shortest path algorithms like Dijkstra's Algorithm that aren't able to detect such a cycle can give an incorrect result because they can go through a negative weight cycle and reduce the path length. Bellman Ford algorithm works by overestimating the length of the path from the starting vertex to all other vertices. Then it iteratively relaxes those estimates by finding new paths that are shorter than the previously overestimated paths. By doing this repeatedly for all vertices, we are able to guarantee that the end result is optimized. Bellman Ford's algorithm and Dijkstra's algorithm are very similar in structure. While Dijkstra looks only to the immediate neighbours of a vertex, Bellman goes through each edge in every iteration. The code for Bellman Ford's Algorithm in C is given below. //No negative weight cycle found!